There are so many talented writers working in the fields of horror and speculative fiction that I'm constantly discovering authors I've not read before who immediately leave me wanting to read more of their work. Case in point, Hank Schwaeble. Prior to being sent a copy of this new collection from Cohesion Press, I'd never even heard of him. Maybe I just need to get out more or stay in and read more. Five of the stories in American Nocturne are original, never-before-published (“American Nocturne,” “Cold Service,” “Nurture,” “Natural Selection,” and “A Murmur of Evil”). The remainder are reprints. But, if you are new to Hank’s work, as I was, that shouldn’t make any difference. American Nocturne - This piece truly sets the mood for the rest of the stories as it opens with a gal at the piano in a nearly empty bar. This quote pretty much sums up all of the stories which follow. "Pieces like this are call nocturnes. They're meant to capture the mood of the night, remind one of things that happen after dark." This particular story has the prose of a classic noir tale. Things aren't always what they seem and the truth is much darker than what you might expect. Midnight Bogey Blues - A bogey is a demon of sorts in this imaginative story of a serial killer traveling down a country road with a severed head in the truck's cab with him. Gomorrah - In this story, a group of guys plan on a night of gay bashing, but things certainly don't go as planned. It also features one of the most disgusting opening lines ever. I can't even bring myself to quote it here. It's really gross. Bone Daddy - A tale of a high priced call girl talked into an on-camera liaison with a very unusual partner. Phantom Hill - Trying to find man with a pure heart in the weird west is anything, but easy. A Murmur of Evil - And right in the middle of the collection is a Carl Kolchak story. What a pleasant surprise. Nurture - One of my favorite stories in the collection and one of the best I've read this year. A cringe-worthy tale of rival academics. To Judge the Quick - More fun in the weird west. A story of a cross and a double cross. Mugwumps - A very effective way of making one's enemies disappear without a trace. Cold Service - Another cool story, this one with a huge twist. Natural Selection - A Lovecraftian tale, and a good one at that. AB-IV - A story set in the world of Robot vs. Zombies, a retro-futuristic comic book universe created by Chris Rydall and Ashley Wood where the human population is facing extinction and pre-programmed robots are waging a post-apocalyptic war against a zombie plague that has blanketed the Earth. Each story in American Nocturne has it's own distinct voice, it's own feel, it's own flavor. It's not at all like a single writer telling a series of stories. It's almost as if each story was written by a different writer. 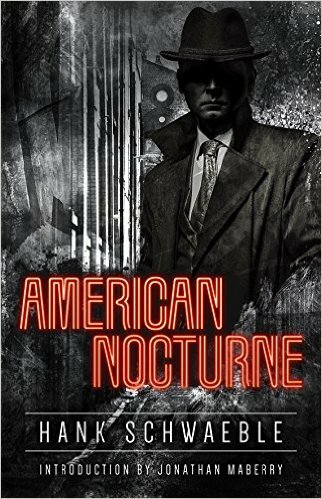 American Nocturne is available now as an e-book from Cohesion Press. If you subscribe to Kindle Unlimited you can read this collection at no additional charge. Also, if you are a member of Amazon Prime, you can borrow this book for FREE from the Kindle Owners Lending Library. This is one collection I can seriously recommend. Hank's first short story, "Mugwumps," (which is included in this collection) appeared in the anthology Alone on the Darkside in 2006. In 2007, he won a Bram Stoker Award for the anthology Five Strokes to Midnight, which he co-edited with Gary Braunbeck. The book was highly regarded, winning two Bram Stoker Awards and a World Fantasy Award nomination. Hank is an active member of the Horror Writers Association and the International Thriller Writers Association. In addition to reading and writing, Hank enjoys keeping in shape and playing guitar. He is currently working on his next novel. The first book in this trilogy, The Bullet-Catcher's Daughter (The Fall of the Gas-Lit Empire #1), came out in August of 2014. At the time, I called it "a beautiful tale of mystery and intrigue.wildly imaginative, and entertaining,"
Unseemly Science (The Fall of the Gas-Lit Empire #2) was released in April of 2015. Not quite as much fun as book one, but still a solid read. 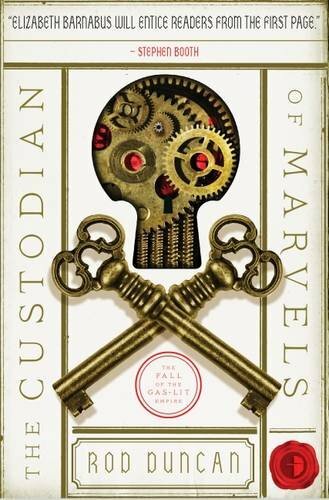 Now comes The Custodian of Marvels: (The Fall of the Gas-Lit Empire, #3), a near perfect end to the trilogy. All of the mysteries are resolved with a fresh story to conclude the adventures of Elizabeth Barnabus and her traveling companions. In the tales that make up The Fall of the Gal-Lit Empire the author has created a not so United Kingdom following a civil war which left England split into two separate countries, the Kingdom and the Anglo-Scottish Republic. Then there's the all-powerful Patent Office meant to protect the citizenry from technology and mechanical devices. The patent Office, it all comes back to the Patent Office, where Elizabeth and her cohorts endeavor to break in, believing this is where all of their questions may be answered by the custodian of marvels. What they find is not what they expect, in more ways than one. All three books in the series are published by Angry Robot Books and are available in a wide variety of formats for your reading and listening pleasure. Although each story works as a stand-alone novel, I recommend reading to entire series for maximum enjoyment. Rod Duncan is a British writer who grew up in Aberystwyth. Identified as dyslexic at the age of eight he made his way through the education system by avoiding writing as much as possible. Being dyslexic, it was the invention of the word processor that enabled him to develop his storytelling and writing skills. He now cleverly uses dictation software as a tool in the writing process. Despite having the word "Zombies" in the title this novel is far from your typical zombie fare. 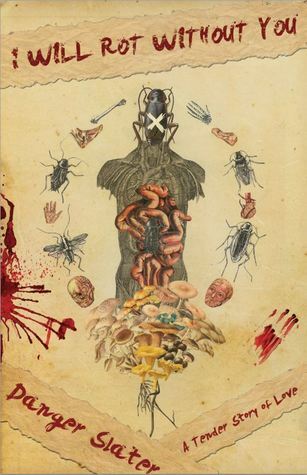 If you're looking for a brain munching gore-fest, you may want to look elsewhere. On the other hand, if you're familiar with the Billy Wilder directed film-noir, The Lost Weekend, based on Charles R. Jackson's 1944 novel of the same name about an alcoholic writer, then you're in for a real treat. It is within this context that The Last Weekend: A Novel of Zombies, Booze, and Power Tools is a great success. In post apocalyptic San Francisco, Vasilis “Billy” Kostopolos, failed writer and accomplished barfly, finds work as a "driller" for the city. It's his job to respond to calls to find the newly dead and destroy the brain before they can reanimate. There's a great line in his interview for the job where one of the interviewers asks his current occupation. When Billy responds with writer, the second interviewer tells the first to put down "unemployed." Mamatas fills this story with interesting characters, top to bottom, even incidental characters, like a typewriter salesman, are fully fleshed out. 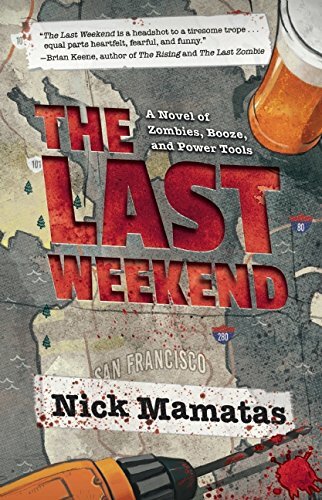 The Last Weekend: A Novel of Zombies, Booze, and Power Tools is a solid literary work on the life a "writer" after the onset of the zombie apocalypse. First published in March of 2014 by PS Publishing, The Last Weekend: A Novel of Zombies, Booze, and Power Tools is now available in Hardback, Paperback, and e-book formats from Night Shade Books. Nick Mamatas is the author of six and a half novels and several collections. Nick is also an anthologist and editor of short fiction including the Bram Stoker Award-inning Haunted Legends (co-edited with Ellen Datlow). His fiction and editorial work has been nominated for the Bram Stoker Award five times, the Hugo Award twice, the World Fantasy Award twice, and the Shirley Jackson, International Horror Guild, and Locus Awards. 2016 is only a few weeks old and already it's showing signs of being a banner year for horror. Whether you're snowbound or it's too cold to venture outside or you're just looking for a great read, Eidolon Avenue: The First Feast will keep you warm and entertained for hours. From the description of the book on the publisher's website. "One building. Five floors. Five doors per floor. Twenty-five nightmares feeding the hunger lurking between the bricks and waiting beneath the boards." If that's not enough to drag you through the front door, kicking and screaming, let me introduce you to the tenants on the first floor. Apartment 1A - Lucky A powerful and jarring story of a Chinese child named for a silent screen goddess, who ended her life with a fistful of sleeping pills, at the too-young age of twenty-four. Little Ruan would grow to become a legend known as Lucky. "Lucky the Killer, Lucky the Devil, Lucky the Shadow." Now in her eighties, the story is told in retrospect as Ruan interacts with the ghosts of her past. Apartment 1B - Bullet A story of a man with a new tattoo which leads to all kinds of problems. Here's just sample of what Jonathan has to offer here. "'I do tats,' she'd said. Goth chick with a Daddy's Girl Gone Bad vibe. Hair fifty shades of black. Bangs chopped with a razor. Big eyes rimmed with black. Skin whiter than rich kid coke. Dark blue smeared on her lips. Metal in her ears, nose, chin. Her small bright teeth chewing dollar store blue from her stubby nails." This story reads like a very strange trip, indeed. Apartment 1C -Click This apartment is occupied by Colton Carryage, son of a wealthy Senator. Wealthy enough to get his son off from some very nasty business that occurred during Colton's time at college. Unfortunately, Colton didn't seem to learn his lesson, if anything the experience has turned him into something even more twisted and disturbed. Apartment 1D - Anniversary This line pretty much says it all. "I met my beloved Benjy one month, married him the next, and then we spent the following fifty years happily trying to kill each other. By choice." This is a somewhat lighter tale of the various failed attempts over those fifty years. 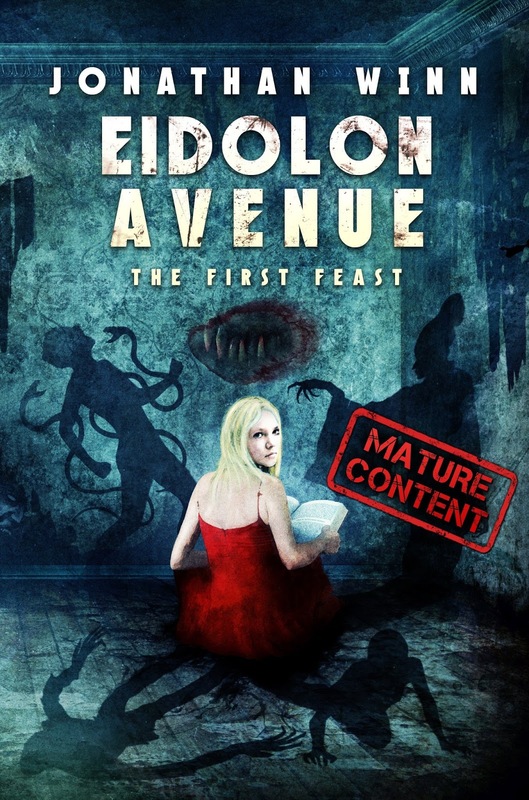 Eidolon Avenue: The First Feast is not for the casual reader. This is a series of stories which require the reader to become immersed in the writer's world or risk becoming lost with little hope of finding one's way home. This is a very disturbing building, occupied by the most depraved tenants, each worse than the last. Often times the line between reality and insanity becomes blurred to the point of being gone completely. If anything, Eidolon Avenue: The First Feast left me wanting more and from what I understand the author is planning to deliver just that with the second feast. From Crystal Lake Publishing Eidolon Avenue: The First Feast is available now in both e-book and paperback formats. If you subscribe to Kindle Unlimited you can read this book at no additional charge. Also, if you are a member of Amazon Prime, you can read this one for FREE through the Kindle Owners Lending Library. Strongly recommended, but with a cover warning for mature content. On the surface Railroad Rising: The Black Powder Rebellion seems like it could be a lot of fun. Part fantasy, part adventure, part steampunk, magic, even a touch of romance. What's not to like? There were a number of things I enjoyed in this work. For example, the story is solid. A magician, named Cartogg, and his armsman come to the aid of the king when he is ambushed at the opening of a railway he has had built for his people. Cartogg proves himself worthy and is soon in the service of the king. It's a good thing the king has Cartogg, since the rebels have magicians of their own. Aside from magic, the magician also shows an aptitude for steam engines and gliders and soon incorporates both into the king's arsenal. My biggest problems with Railroad Rising: The Black Powder Rebellion was its repetitiveness. Again and again, throughout the story, Cartogg is worried that he will lose favor with the king and the possible consequences of such an occurrence. I can understand his feelings, but not the author's need to remind us incessantly. The writing is capable, but I found the storytelling to be lackluster. What strengths there were in this book were found in the relationships between the characters. In the end, I'm glad I read Railroad Rising: The Black Powder Rebellion, but if there is a sequel I don't think I'd be likely to go there. 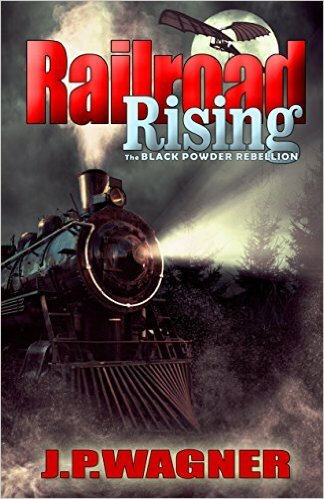 Railroad Rising: The Black Powder Rebellion is available as an e-book from EDGE-Lite, an imprint of Hades Publications, Inc.
Railroad Rising: The Black Powder Rebellion has been published posthumously, as the author passed away in 2015, my condolences to his family and friends. A marriage that's falling apart, an apparent suicide, and a haunting that turns out to be so much more. Death Do Us Part by JG Faherty is a thrill ride from start to finish. A complex tale of the lengths one will go to for love and what the dead will do for revenge. This is one of those stories that just reaches out from the pages, grabs you by the collar, and shakes and shakes until you collapse from exhaustion. Art Stanhope has just asked his wife, Catherine, for a divorce. Next thing you know she's driving into a river ending her life, apparently by suicide. The reader knows there's more to the story, but the who and why are saved until the very end, with numerous twists along the way. As a novella, Death Do Us Part is a quick read. The pacing is close to perfect and the overall idea is fresh and enjoyable. 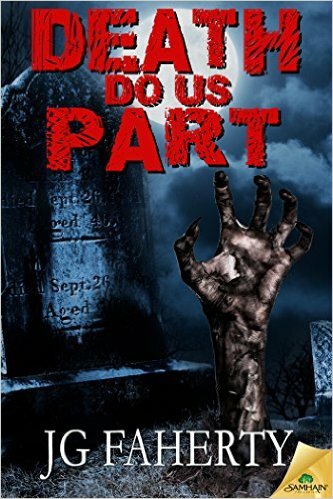 Death Do Us Part is available now as an e-book from Samhain Horror. JG Faherty is a life-long resident of New York's haunted Hudson Valley. He's been a finalist for both the Bram Stoker Award and the ITW Thriller Award. He's the author of six novels, including his most recent, The Cure. as well as eight novellas and more than 50 short stories. I Will Rot Without You was sent to Cemetery Dance for review and when I saw it on the list of books offered this month, I recognized the name from Goodreads and thought this might be interesting. I love it when I'm right. Before I get into the heart of the review, let me hit on what kept me from being over-the-top in love with this book. Because it is written entirely in the first person, there were numerous times where I wondered whether I was reading what amounted to grammatical errors on the part of the writer or if the errors were due to the character's lack of education. Lines like "and then the dreams ends" and "it feels like signal" drove me to distraction. There were too many to ignore. Aside from the minor irritation mentioned above, I really enjoyed Danger Slater's writing style. It's gonzo or bizarro writing with a bit of beautiful prose mixed in. At times surreal and totally off-the-wall, yet the underlying story is charming. Its so much more than in-your-face splatterpunk, it truly defies description. Ernie Cotard is having one helluva bad day. Before I get to the bottom of page one, my skin is crawling. God, I hate cockroaches, and mold, I hate mold, too. Both figure heavily in the telling of this story. Filled with a cast of colorful characters, including a neighbor of the Ernie's who has his long-dead wife still sitting at the kitchen table. "The body of this woman sits at the kitchen table. Her hair is ash gray, long and frazzled. Yellow fingernails curl from the ends of her hands and her teeth are protruding out of her face as the slow decomposition she had obviously experienced softened and squashed her deformed skull. Mummified, exsiccated skin--equal parts purple and brown--pruned and completely depleted of all moisture. She is full of holes which the roaches climb in and out of, almost as if she were just another wall for them to burrow." I Will Rot Without You is at times humorous, at times touching, but mostly utterly disgusting. And bloody, let's not leave out bloody. There are literally buckets of blood. If you are in the mood for something different, something which will likely leave you shaking your head. This is that book. Published by Fungasm Press, I Will Rot Without You is recommended for the truly adventurous reader. That appear in the firmament. Thus help me God Father, Son, and Holy host. Amen. Victor Teversham is worth nearly a billion dollars. It's not enough to protect him from tragedy as his wife, Josephine, takes her life shortly after booking a stay at the Ballador House Hotel. Her suicide note, scrawled in lipstick on the bathroom mirror read: God forgive me. I married an evil man. Despite being in mourning, Victor keeps the reservation for the Ballador House. A hotel with an unusual reputation for generating nightmares. Previous guests have described their experiences as "beyond anything the conscious mind could conceive," "vivid as life," and "better than any horror film ever made or that ever could be made." On the surface Prince of Nightmares reads like a modern day gothic horror story. A haunted hotel with a number of resident spirits, but before long the reader will realize this is much more than a run of the mill ghost story. Much like Victor, the reader is often left wondering exactly where the line is between nightmare and reality. 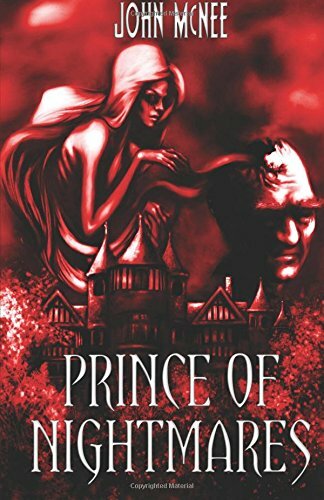 It wasn't until I finished reading Prince of Nightmares that I realized this is John McNee's first novel. This makes John someone to keep an eye on. Aside from a hugely entertaining story, John also is a skilled craftsman with writing conversation. Many novelists, even the most successful, seem to struggle with this aspect of their writing, but I found the dialog in John's writing to be so real and comfortable, it was worth mentioning. At times brutally visceral, Prince of Nightmares is not for the faint of heart, but it is for any horror lover looking for something original and entertaining. This one is well worth your time and reading dollars. Published by Blood Bound Books, Prince of Nightmares is available in both paperback and e-book formats. My first highly recommended read of 2016. John McNee lives in the west of Scotland, where he is employed as a magazine editor. A tragic accident is just the start of a series of events that ripple from the incident the way a tsunami grows from an earthquake in the middle of the Pacific ocean. One event, one small moment in time, touching and destroying the lives of so many. Lee Thompson has assembled a diverse cast of characters, each with their own quirks and nuances. In the words of one of those characters, "The world is full of surprises when you're out there on the razor's edge." Filled with twists and turns the story starts fast and the pace continues to grow right through to the pulse-pounding conclusion. After the Fog Clears left me drained and completely satisfied. Available as a signed limited edition hardback for now. After the Fog Clears is published by Darkfuse. Hopefully there will be an e-book soon. 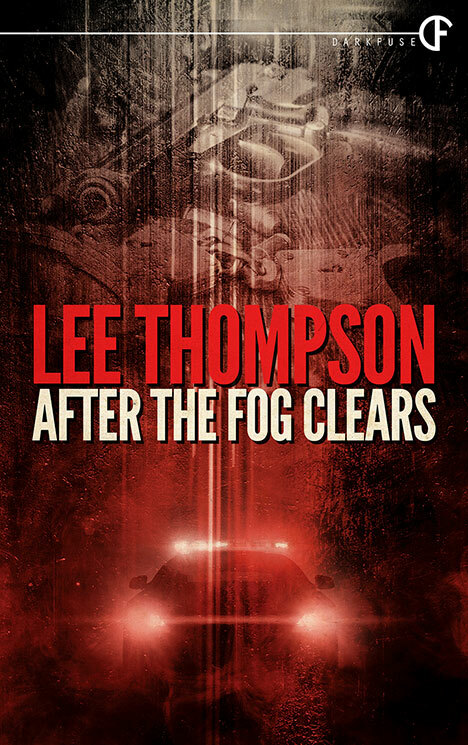 Lee Thompson is a bestselling author with an emphasis on horror, crime, and dark fantasy. The dominating threads weaved throughout his work are love, loss, and learning how to live again. A firm believer in the enduring power of the human spirit, Lee believes that stories, no matter their format, set us on the path of transformation. I've found myself reading more and more anthologies and collections these days. Don't get me wrong, I still enjoy story-telling in the long form, but there's something about anthologies that allow you to get to know a lot of new authors quickly and then there are the collections for a single author which permit a more in-depth look into what makes a particular author tick. Prior to reading Flowers In a Dumpster, I had not read anything by Mark Allan Gunnells'. Now that I've gotten to know his work, I'm pretty sure I'll be returning for more. While not every story was Grade A, enough of them were to make this volume a worthwhile read for all horror fans. Past Lives - A strong story to begin the collection. Features a nice twist with a traveler in a post apocalyptic world. The Support Group - An interesting exercise in writing, Each character in the support group was a major city. Strange, but as I said, interesting. Welcome - A car breaks down, but at least it's in a nice neighborhood, not some crazy remote backwoods location. What could possibly go wrong? One of my favorite stories in the collection. Transformations - Conjuring a demon, for any reason, is never a good idea. Seems the little devils just can't be trusted. The Bonadventure - Another of my favorite stories in the collection is this tale of the Savannah College of Art and Design Paranormal Investigative Team. That's right, S.C.A.D.P.I.T. What they discover in an old cemetery, in America's most haunted city, is much more frightening than ghosts. A Helping Hand - A short, but nasty story of a writer's mother-in-law who moves in to help with her grandchild when her daughter dies during childbirth. The Possession - There is a lesson to be learned here. Finding spells on the internet and playing around with them rarely works out for the best. A killer opening line, too. "Okay, let's get one thing straight. I did not murder Dirk Vandercock." The Locked Tower - This is a top-notch story. Just what is the mystery of the tower of Winnie Davis Hall at Limestone College? Expectant - A delightfully twisted tale of an unexpected pregnancy. The Last Men On Earth - After a plague kills off nearly everyone on the planet. Only two men remain. Adam and Adam, as it were, or at least until Eve shows up. Similar Interests - I absolutely loved the concept for this story. My wife and I were just discussing the dangers of hitchhiking a few days ago. Creepy. Walking Talking Jesus - The title says it all. As I read the stories in this collection, it's interesting to see how Mark Allan Gunnells will take a simple notion and flesh it out into a story. Survival of the Fittest - Even after a plague, the old prejudices still exist. Land of Plenty - A land of plenty, but only for 75 villagers. A thought-provoking little story. What She Needs - Another twisted little tale. This one about abusive relationships. Welcome Back - A nice little follow-up to the earlier story, "Welcome." Kindred Spirit (Co-authored by Shane Nelson) - An excellent little novellette to close out the collection. All about a writer finding his voice with the help of a kindred spirit. Seventeen stories and when I was done reading, I found myself wanting more. 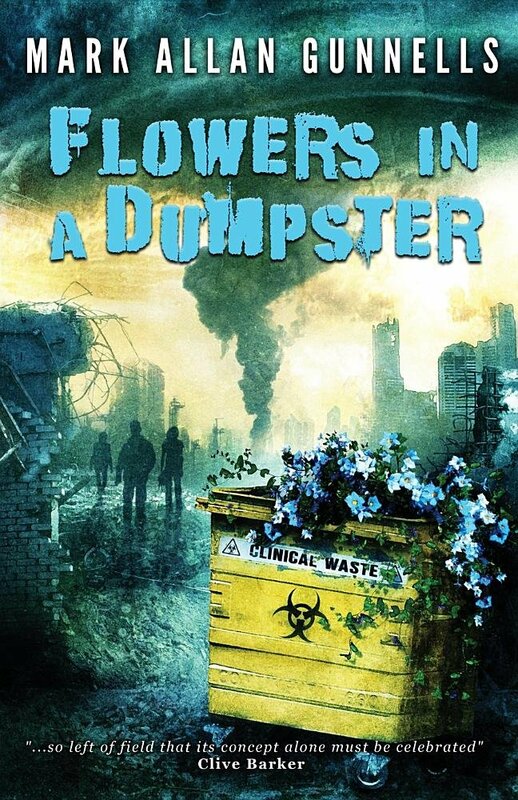 Flowers In a Dumpster is from Crystal Lake Publishing and is available in both e-book and paperback formats. If you subscribe to Kindle Unlimited, you can read it for no additional charge and if you are a member of Amazon Prime, you can borrow this one for FREE from the Kindle Owners Lending Library. I first encountered the writing of Duncan McGeary about a year ago when his book Tuskers was released. Before that time, I had never heard of javelinas or skunk pigs, but a quick check of Wikipedia revealed they are real and can be found in Arizona where Tuskers is set. Through an evolutionary quirk a small Arizona community is terrorized by these pig-like creatures who are exhibiting cunning behavior and in some ways are out-smarting their human prey. Tuskers and Tuskers II:Day of the Long Pig are both great fun and well worth checking out and I'm eagerly awaiting the release of the third book in that series. Duncan's newest book is something totally different, The Manic Pixie Dream Girl Murders: Blood of the Succubus is a very sexual, highly adult romp through the ages with three succubae known as the Three Daughters of Lilith, Agrat Bat, Naamah, and Eisheth. Each with their own charms, making them all but irresistible to men leaving them drained of their life force, often to the point of death. While I enjoyed The Manic Pixie Dream Girl Murders: Blood of the Succubus it's certainly not for everyone. If it was a movie, it would certainly be rated R, or depending how it was cut, NC-17 or even X. Although this is a stand-alone novel with a solid conclusion, McGeary has deftly opened the door for a possible sequel should he decide to go there. I, for one, would love to go along for the ride. 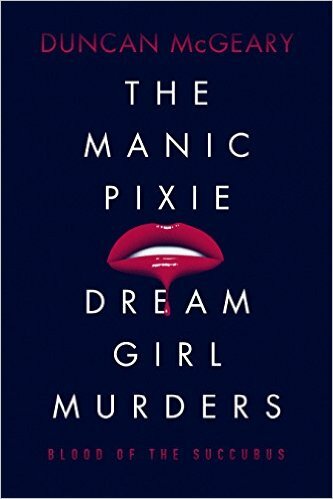 The Manic Pixie Dream Girl Murders: Blood of the Succubus has it's heroes, villains, and those who walk the line between the two. The book is available as an e-book through Amazon.com. 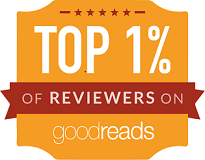 If you subscribe to Kindle Unlimited, you can read it at no additional charge. Also, if you are an Amazon Prime member you can read it for FREE through the Kindle Owners Lending Library.